Back in the August 2015 issue, I reviewed Vintage Strings from Big Fish Audio and was suitably impressed with the collection of sounds and their authentic ’60s and ’70s vibe. BFA are now back with a further dollop of ‘vintage’ and this time it’s the rhythm section that is the target. 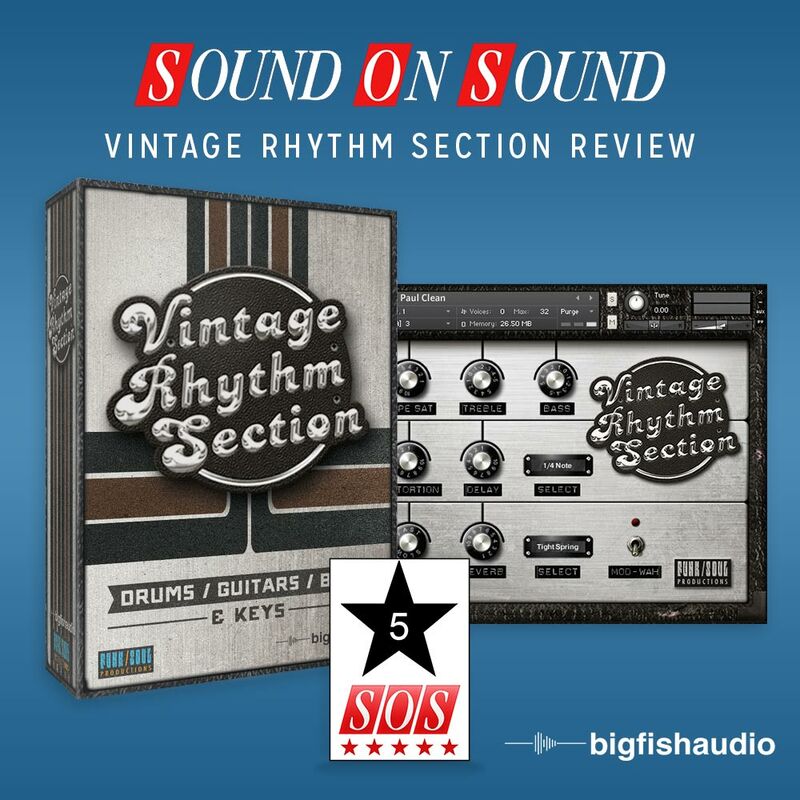 Vintage Rhythm Section packs some 16GB of sample data into 67 Kontakt instrument patches (plus some multis) and is aimed very firmly at R&B, jazz and rock styles, but with a very deliberate retro character to the sound. There is nothing too unconventional about the library’s structure. What we get here is an impressive array of playable, multi-sampled virtual instruments with keyswitched articulations and some useful ‘performance’ samples (for example, on the basses, you get some nice note slides to add a little extra ornamentation). These are all accessed via two distinct Kontakt front-ends; a dedicated 12-channel virtual mixer for the drum instruments and a suitably retro-styled virtual ‘amp’ for the bass, keyboard, guitar and occasional percussion instruments. Both of these includes tape saturation effects — alongside some other rather nice effects options — that adds some very effective analogue-style warmth and/or crunch to the sounds (as well as a little compression), depending upon how hard you push it. As to the sounds themselves... well, they sound excellent, although that’s not to say pristine; these are apparently genuine vintage instruments recorded with vintage recording kit and, on the whole, the results capture the flavour of the intended retro sound brilliantly. I particularly liked the bass (including electric and acoustic variants) and keyboard (classic organs, electric pianos, Wurlis, Clavinets and so on) sounds. Whether you want something for funk, a little bit of soul, a jazz influence or some classic (pre-1980) rock, Vintage Rhythm Section will have you covered. The drum sounds are just as good and perhaps the only sound group that doesn’t quite keep up is the guitars. That’s not to say they don’t sound great — they do — but as with many sampled guitars, while they are excellent for some single-note or picked-chord performances, emulating strummed parts is more challenging. However, if you are after a James Bond melody, a touch of surf lead or some mellow jazz guitar runs (amongst others), then there are patches here that will work very nicely, thank you. If you are a busy media composer looking for an instant slice of ’60s or ’80s instrumentation with a minimum of fuss, Vintage Rhythm Section is going to be very tempting. Yes, there is still the task of having to play these virtual instruments in a fashion that captures the musical styles that they so obviously suit. However, if you have the musical skills to pull that off, Vintage Rhythm Section does a rather good job of being a hi-tech sonic time machine to the pre-digital period of popular music production.